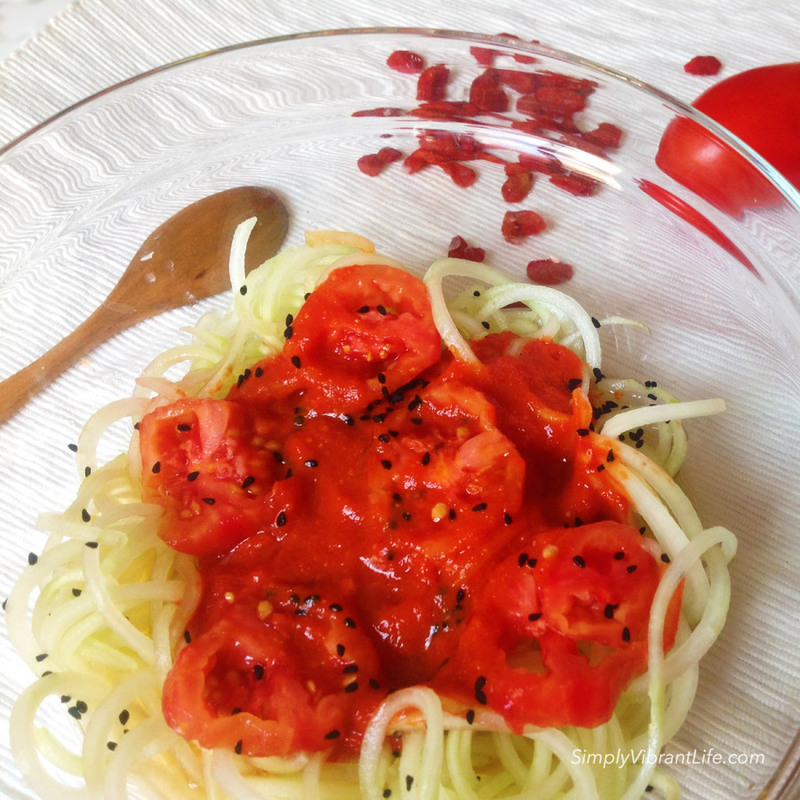 Have you ever tried cucumber noodles with raw vegan ketchup? Cucumber noodles are spiralized cucumbers, as some of you might already know. You can quickly make them with a simple and affordable machine called spiralizer. 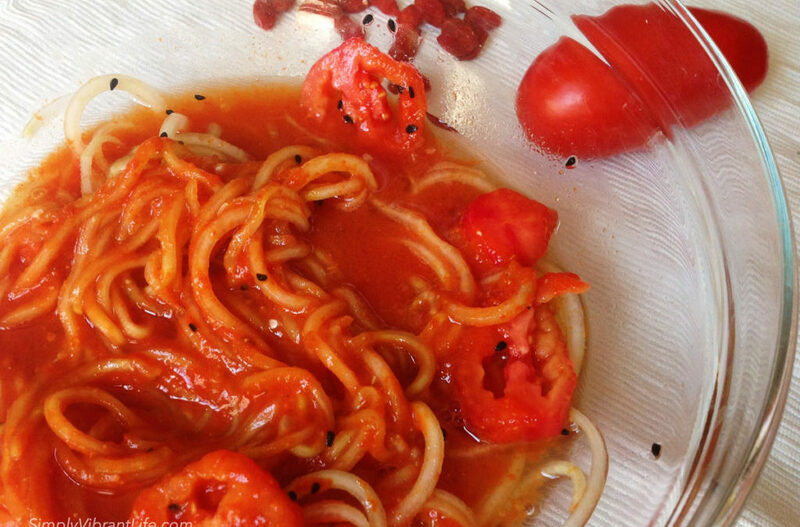 I made this fat-free ketchup with sweet goji berries. I warmly recommend keeping your fat away from the fruit so that you can stay fit, healthy, bloat-free and gas-free. There is an extended explanation on raw food combining in our “Simply Vibrant Recipes” e-book. You can get it here. If you like to have lots of energy after your lunch, the best food choice would be a high carbohydrate raw vegan meal. In case you don’t feel like eating anything sweet, like a fruit smoothie, you can have a savory meal fat-free meal, like these noodles. If you are craving a sweet green smoothie for lunch, you can learn how to create bloat free smoothie recipes here. The reason we feel more energetic after a fat-free, carbohydrate-rich meal is that fat takes much more energy to digest, than simple carbohydrates. For the ketchup, I just used our home-grown tomatoes, soaked goji berries and turmeric with a sprinkle of black cumin seeds on top. I didn’t even add salt to this ketchup because it’s so sweet and tasty just as it is. It’s always best to use raw spices. If you can find fresh turmeric root, that would be great! Turmeric has a strong anti-inflammatory property and helps to improve your immune system. For the more traditional ketchup taste, you can experiment with adding dried garlic and onion, black and red pepper, fresh ginger and a squeeze of lemon juice. You can also use unprocessed sea salt or any other type of naturally dried salt if you wish.